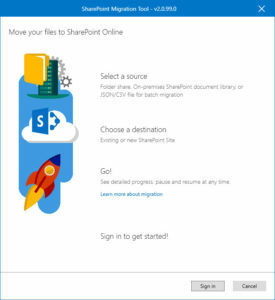 SharePont Migration Tool is Microsoft tool for migrating documents to SharePoint Online and OneDrive in Office 365 from shared folders or SharePoint On-Premise sites. From Shared Folders to Office 365: to migrate documentation to the cloud. 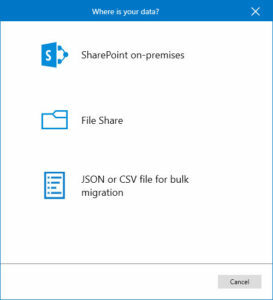 From SharePoint On Premise to Office 365: to migrate SharePoint-specific content such as lists and libraries. It allows incremental migrations: so that only new or modified documents / items are updated, allowing to stagger the migration process and reduce blocking times during migration. You can configure the migration with a CSV or JSON file that contains a list of sources and destinations and define some configuration parameters for the migration. From the interface you can also generate and save migration tasks to be re-runned at another time. It is a Microsoft tool: the fact that it is Microsoft’s official tool for migrations gives certain guarantees in terms of compatibility with the platform and possible updates to Office 365. It is free: unlike other third-party products such as ShareGate that have high licensing costs, it is completely free and you only need a office 365 subscription to use the tool. The interface is simple and friendly: it is very easy to use since migrations can be launched in just three steps. It isfunctional: it is sufficiently complete for simple content migrations. The tool is very recent: it has only been available for a few months now, which means that you can find some bugs that you would not have in other applications. The current version (v2) es is not compatible with versions prior to SharePoint Server 2013. It cannot currently perform advanced migrations of complex site structure from On-Premise platforms that include dependency management, customizations, advanced metadata mapping, massive edition of items, etc. Other products like ShareGate can handle these. 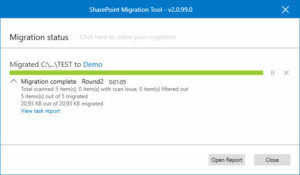 Without a doubt, the SharePoint Migration Tool is a very good option for most migrations. Being the official tool of Microsoft (and free!) is a very important point to take into account when planning a migration to the cloud. Regarding their shortcomings, Microsoft is adding new features and improvements on a regular basis and it seems that it will continue to be improved and will probably become the reference tool for SharePoint Online migrations. Microsoft also commented that they will extend the compatibility with versions prior to SharePoint Server 2013 although at the moment we don’t know when this will be available.